ONE TABLET PER DAY WITH YOUR MAIN MEAL. Swallow with water or a cold drink. Not to be chewed. Do not exceed the recommended intake. Only to be taken on a full stomach. Can be continued for as long as required. This comprehensive formula replaces other Immunace supplements and multivitamins. There is no need to take an additional multivitamin. As with other food supplements, consult your doctor or pharmacist before using if you are under medical supervision, pregnant, breast-feeding, have epilepsy, a thyroid condition, haemochromatosis, suffer from food allergies, or are allergic to any of the ingredients. Made in a site that may handle nuts. As Immunace contains vitamin K, if you are taking oral anticoagulants (e.g. blood thinning medication) do not take these tablets except on the advice of a doctor. Why has Immunace Extra Protection been developed? When is Immunace Extra Protection recommended ? Can Immunace Extra Protection be used simultaneously with medications? How many tablets does one pack of Immunace Extra Protection contain? How and when should Immunace Extra Protection be used? Are there any undesired effects whilst taking Immunace Extra Protection ? Research shows that our bodies often lack the specific nutrients required to help maintain the normal function of the immune system. Fruit and vegetables are the richest source of important antioxidants, but there is growing evidence that most western diets do not provide sufficient amounts. Immunace Extra Protection provides a synergistic combination of 28 nutrients, vitamins, minerals, amino acids, and bioflavonoids as well as nutrients such as: natural lycopene, l-carnitine, resveratrol, astaxanthin, alpha lipoic acid plus additional vitamin D (1000 IU) which contributes to normal immune system function. 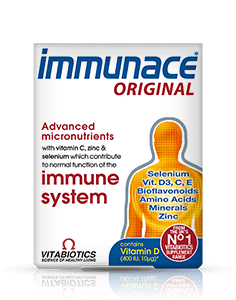 Immunace Extra Protection contains a wide spectrum of nutrients because studies suggest that the full range of specific nutrients is more effective when combined. Immunace Extra Protection is recommended for men and women as a daily nutritional safeguard with vitamin D3, zinc & selenium which contribute to the normal function of the immune system. 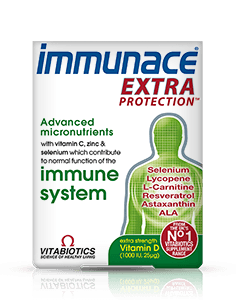 Immunace Extra Protection may also be used as a daily multivitamin supplement. Immunace Extra Protection can be taken for as long as required. There is no maximum length of time over which it may be used. Generally, Immunace Extra Protection may be used along-side medications because it contains only moderate levels of vitamins and minerals, and is free from drugs and hormones. For specific advice on taking Immunace Extra Protection with medicines, we recommend that you contact your doctor or pharmacist first. Immunace Extra Protection contains 30 one a day tablets per pack. One tablet per day is recommended with or immediately after your main meal, swallow with water or a cold drink. Taking the tablet with a large meal maximises the absorption of the nutrients, and can reduce mild nausea, which is sometimes experienced if any multivitamins are taken on an empty stomach. Immunace Extra Protection should only be taken on a full stomach. Always ensure that Immunace Extra Protection is taken with plenty of liquid to wash the tablet down. Immunace Extra Protection has no known side-effects when taken as directed. Do not exceed the recommended tablet intake. In case of overdose, seek medical advice immediately. Results vary amongst individuals, but in most cases we would expect the beneficial effects of the vitamins and minerals in Immunace Extra Protection to build over several weeks. There is no maximum length of time over which ImmunaceExtra Protection may be used. A regular intake is recommended.